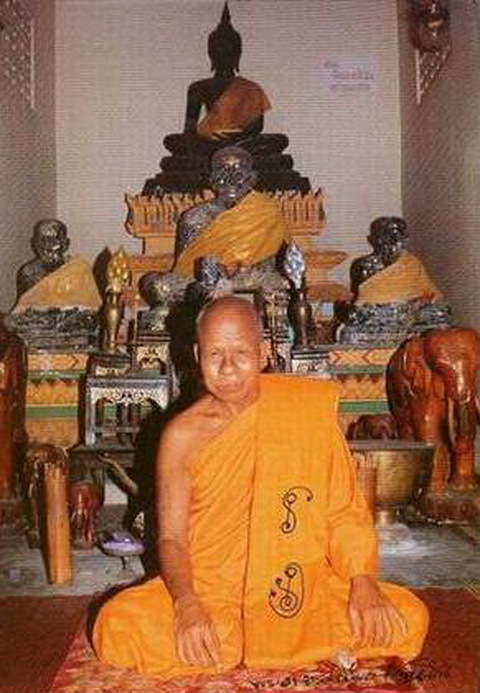 Luang Por Khiaw is commonly known in Thailand as ‘Por Tan Khiaw’ – Renowned for his amazing ability to empower amulets with both Pranic and Jhanic forces, he has mastered a host of different Wicha. He is one of Thailands Greatest amulet makers, and builder of the Giant LP Thuat statue in Kalimantan, Malaysia. Luang Por Khiaw or, ‘Pra Kroo Anusaasanagijatorn’, of Wat Aranyawasigaram (locals call the temple ‘Wat Huay Ngo’), in Pattani. The local Folk call him ‘Dta Luang’ or ‘Dta Luang Khiaw’. Born; August 2472 BE in Tambon Hnaa Tham, Yala Province. He left school at the class of Por 4 and had to work to look after his younger relatives, because his Father had already passed away. Ordination as a Bhikkhu; He was ordained at Wat Buppanimit (Wat Nang O), in Mae Laan, Pattani. His Upachaya (Ordaining Officer), was Pra Kroo Manunyasamanagarn of Wat Palaanupaap. 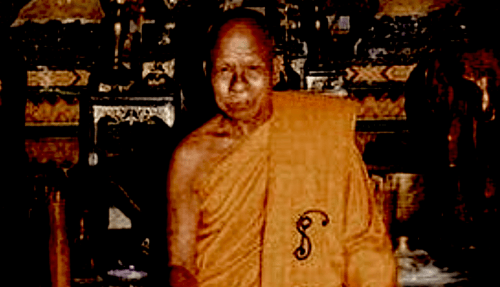 Dhamma study; He studied Bpariyadtitam (theoretical Dhamma) and ‘Nak Tam’ (next graduation of doctorate), specializing in both the sextor of Mantra and Prayer chanting and Ceremonies. He was able to chant the Patimokkha completely after a mere 5 years of Ordination. Apart from this, he studied various Wicha of Saiyasart from many different Lay Masters, who shared their Magical Knowledge with him, passing on their Wicha to Luang Por.